Pink Lemonade, this adorable Li'l Sweet & Sassy stuffed pony, is a great companion for imaginative adventure. 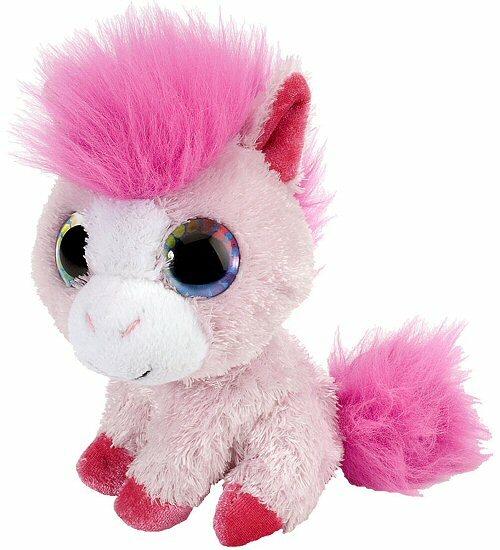 With soft light pink fur, hot pink feet and fluffy mane and tail, and a sweet smiling face, this sweet plush pony has the most beautiful blue eyes surrounded by a rainbow of colorful hearts! Look into their depths and you're sure to feel warm fuzzies. Another great thing is that when you purchase this lovable Li'l Sweet & Sassy plush horse, a portion of the proceeds helps to provide housing and education for disadvantaged children, as well as protection for abandoned animals throughout the world. Fun Facts about Horses: Did you know that while there is only one species of domestic horse, there are over 400 different breeds? Wow! How many horse breeds can you name? Arabian, Mustang, Lipizzaner, American Quarter Horse, Appaloosa... You can take it from here!